December 18, 2010 by Alphageek in "alphageek", "review", "urbanspoon"
This is yet another delicious choice for Thai food in the Fredericksburg area. Mrs. Alphageek and I were out Christmas shopping, and decided we wanted to try something new. We stopped in, and took a seat. We looked over the extensive menu, but I already knew what I would order. When I try a new Thai restaurant, I always want to try pad ka prow, or some variation on that spelling. So go ahead and complain, but I have seen it spelled many ways and I really don't care as long as I get something delicious to eat. I think here they call it kapow, or something like that. Mrs. Alphageek decided on Chu chee beef with scallop. Her appetizer over on the left, appeared at the table quickly. 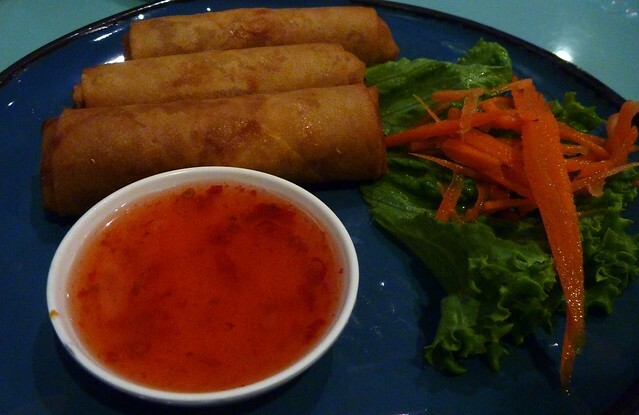 Her appetizer was three vegetarian spring rolls. Ordinarily, I am not a big fan of egg rolls, spring rolls, or fried rolls in general. They usually taste the same, I think because the oil never gets changed. Mrs. Alphageek said these were worth a try, so I tried part of one. Simply put: it is one of the best spring rolls I have had in years. It was light and crispy. without even a hint of that oily taste I associate with these kind of rolls. After the spring roll, I was excited to try our food. First to arrive was my kapow. I ordered it extra spicy. After all, it was a cold winter day and I wanted something to warm me up. What arrived did not disappoint on any front. It was simply flavorful and spicy, just the way I like it. However, the arrival of my food was upstaged by Mrs. Alphageek's dish a few seconds later. Her Chu chee beef with scallop arrived in dramatic fashion, on a plate usually reserved for fajitas, steaming loudly to our child like delight. 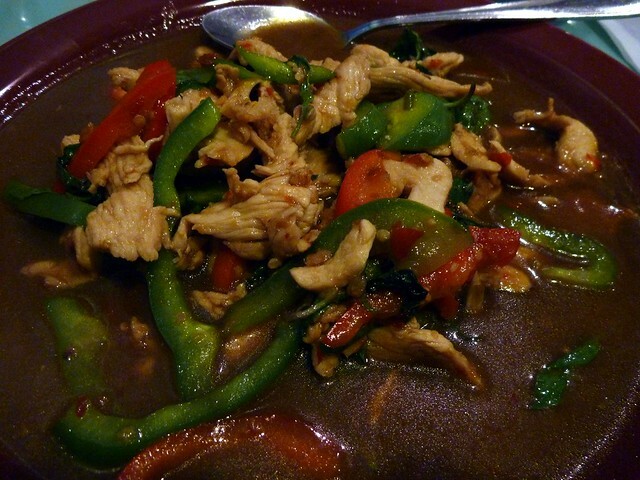 However, there was nothing child like in the dish as it was a wonderful mixture of exotic Thai flavors that we both enjoy. 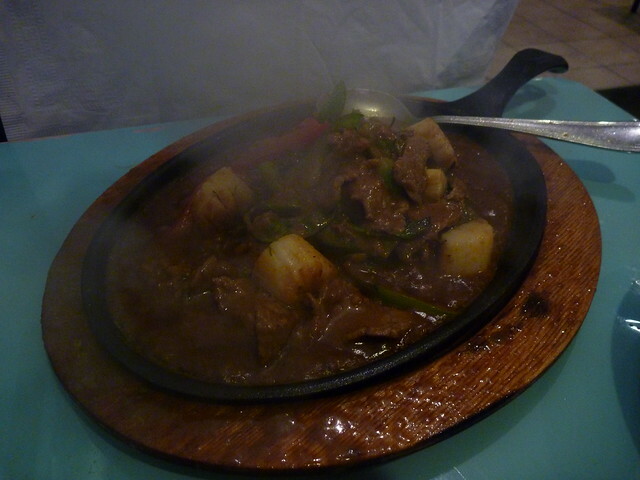 It was a dish that was as fun to eat, as it was to watch sizzle away at the table. I can safely say that while this is our first time at this restaurant, it certainly will not be out last. We look forward to trying something else on the menu the next time we are there.